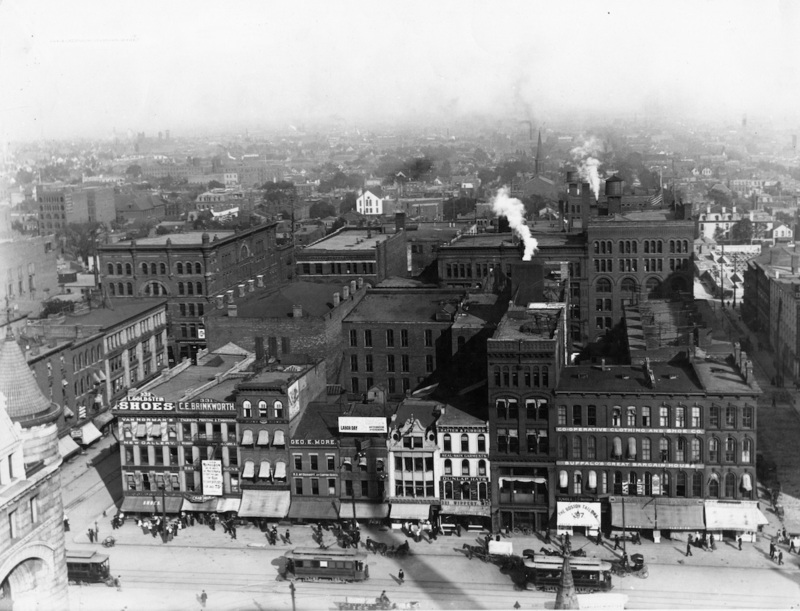 After the introduction of the electric streetcar in 1890 and the perfection of steel-framed construction the same decade, downtown Buffalo roared with never before seen density and activity. Shelton Square was the core of the streetcar network and, when this photograph was taken in 1894, the place of greatest urban intensity. This block of Main Street between North Division and South Division streets, looking east from Shelton Square, is an urban hive. Signs for L. Goldstein shoes, C.E. Brinkworth signs, George E. Moore shoes, Wippert hatter and furrier, and Cooperative Clothing & Shoe Company are visible along Main Street. This block, and the block behind it, and the block behind that, were largely intact until the Church Street Extension Mall was built in 1967.